I’m new at longarm quilting and have heard people talk about turning the quilt to stitch the side borders. How do you do this and how do you know when the quilt has to be turned? Kimmy says – Ah, the age old question; to turn or not to turn? I have to admit that my preference is to avoid turning whenever possible, simply because I always feel that when the quilt is unpinned and off the table, no matter how temporarily, it’s time for that quilt to go away and for a thrilling new quilt to be pinned on in its place. On the other hand, I must also admit that there are times when my quilting design choice requires turning if it’s to be properly executed and there are no two ways about it and if I want my design to stitch out flawlessly I’m just going to have to bite the bullet and go get the pincushion. Before we talk about how to turn the quilt, though, let’s talk about when. In general, a design that is ‘busy’ will be a lot easier to fudge than a design that is smooth and simple. For example, take a look at Photo A. Once the quilt is loaded up, all you’d have to do is follow the chalked lines and ta-da! The design would finish beautifully with no turning required. However, not all designs can handle being quilted in fits and starts. The Serpentine Feather shown in Photo C is an example of such a design. As you can see, numerous stops and starts would be glaringly obvious in this smooth, flowing design and a pattern like this almost always works out best when the quilt is turned and the design stitched out in one fell swoop. The Argyle design in Photo D is an example of a design that in theory could be stitched in bits and pieces through the placement of pre-marked tick marks showing where to pivot each stitching line. However, in reality, it would be quite time-consuming to do so, and you’d be limited to such small sections of the design in each segment that it would actually save you considerable time to just turn the quilt, stitch it all at once and get it over with. In a nutshell, if you wish to avoid turning, you will want to look for slightly busier designs that have hiding places for your stops and starts and that look as if they could be quilted in ‘chunks.’ If, on the other hand, you wish to stitch smooth and flowing designs, do so with the knowledge that you will probably be much happier with the results if you turn the quilt. Now that we’ve covered the when, let’s talk about the how. Turning a quilt is technically quite easy but it does require a small amount of preparation when initially loading the quilt. In the simplest possible terms, loading a quilt is all about straight lines, particularly if you hope to end up with nice looking borders and corners. For example, if you will be stitching out a design that requires precise layout so that the design will accurately flow into and out of the corners, then you must make sure that you take the time to load the quilt so that the corners are at a true 90 degree angle and the border seam lines and the border itself comes into and out of those corners in nice straight lines. (If you are unsure about how to load properly, refer to my column in the March 2011 issue of this magazine for tips on how to load a nice straight quilt.) By doing this, you are setting yourself up for success when it comes time for you to turn the quilt and make those side borders line up with all of your previous stitching. Before loading, mark the centers of all four of the borders so that; A. You will know when to make your border pattern change direction, if applicable, and B. You will be able to quickly find your centers when it’s time to remount the turned quilt. Take pains during the quilting process to keep all of your straight lines straight so that when you come to the bottom border you have a beautifully straight seam line connecting your bottom border to the body of the quilt, which will eliminate the frustration of trying to fit a straight border pattern into a wobbly serpentine space. When turning a quilt, the stitching order is as follows; if you plan to do stitch in the ditch on this quilt, first SID along the seam line which connects the top border to the body of the quilt. If you will not be doing any SID, skip this step. Stitch the top border, including the corners. 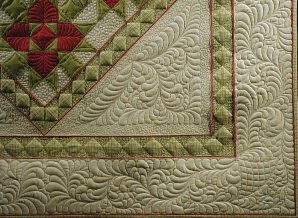 Begin to work your way through the quilt, being sure to either pin baste or use large basting stitches in the side borders. **Remember, you can’t work your way merrily through the quilt without doing something to secure those side borders, because if you do you will almost certainly get puckers and tucks when you turn and remount the quilt! (I use flat flower head pins and place a pin every 3-4 inches, securing all three layers together to prevent any shifting of the quilt sandwich. Once the quilt has been turned and remounted, I pull the pins out just before quilting. 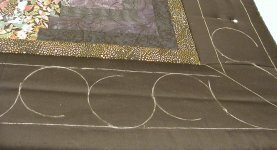 If there is quite a bit of fullness in the border which needs to be more firmly controlled, I will use large basting stitches in place of the pins.) When you get to the bottom of the quilt, SID the seam line which connects the bottom border to the body of the quilt (only if you are doing SID, otherwise skip this step) and then stitch the bottom border pattern, including the corners. Next, unpin the quilt and remove it from the machine. At this point, I use a rotary ruler and cutter to very carefully trim away most of the excess backing fabric, leaving about 2 inches of excess and creating a nice straight edge to pin to the leaders. 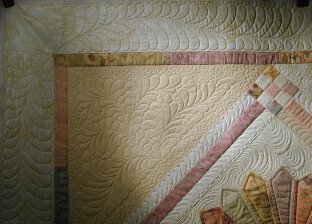 **I do not trim the excess backing even with the edges of my quilt, as this would leave me nowhere to pin and would also leave me no room to maneuver tools or templates when stitching my border design as well as nowhere to place clamps on my side borders. Taking the quilt back to the machine, I line up the pre-marked centers of my side borders (which are now my top and bottom borders) and pin the trimmed backing to the leaders, being very careful not to stretch the backing as I pin. I then stitch out my quilting design in the two unquilted borders, making sure to line everything up first so that my design flows perfectly into and out of the previously stitched corners. Once the borders have been completed, I wrap up any unfinished work in the body of the quilt, give the entire quilt a quick once-over to make sure I haven’t missed anything and then remove the quilt from the frame for the last time. While this may sound like a long and involved process, it is really quite easy and is well worth the effort as it will make those ‘turn-y’ border patterns come out flawlessly. Just take the time to line everything up properly before stitching and you will have no trouble at all!